“Amy” stars the late singer-songwriter, Amy Winehouse. Photo Credit: A24 Films. Amy tells the story of one of the biggest music icons – singer-songwriter Amy Winehouse’s instant fame and the fight against what else it had to offer. The biographical documentary, by BAFTA winning filmmaker Asif Kapadia (Senna, 2010), features unseen archival footage along with never before heard tracks from Winehouse. The shy, humble, Jewish girl from North London was described as a “complete force of nature” at 18 years old. Inspired by jazz and soul greats like James Taylor, Carole King, and Tony Bennett, Winehouse wanted to imitate their chords, but leave the baggage of fame behind. After her parents devastating divorce in her teen years, she began to act out and develop resistance to authority figures as her mother even stated she was too soft for her daughter. With little direction during some of the most influential years of life, it quickly becomes apparent that she in fact just needed…a parent. The film is mainly comprised of personal photos and videos shot by family, friends and her manager Nick Shymansky. Winehouse’s best friends Juliette Ashby and Lauren Gilbert provide a touching narrative throughout along with Shymansky. Selected tracks within help shape the story like “Rehab” and “Love is a Losing Game.” The documentary is certainly longer in runtime than necessary and takes a while to ramp up. At times, it’s like watching a long-winded episode of the reality series Intervention, but a celebrity edition. While the raw home videos are obviously original and irreplaceable, there are several times in the film when I thought about audience members who may be prone to motion sickness, due to shaky camera work. As Winehouse got bigger, so did her hair, but not her ego, as one would expect from such a rise of fame. Winehouse was (apparently) introduced to drugs – crack cocaine and heroin – by her long-time boyfriend and later husband Blake Fielder-Civil, which is how she dealt with the “pain of fame,” if you will. Winehouse was constantly torn between the guy she loved and keeping up with the substances at the same time. The ruthless British media never gave her an inch of breathing room, and neither did her father, Mitch Winehouse, who knowingly pushed her way past her limit. While there are some recent stories that say Mitch claims the documentary inaccurately depicts him and Amy and that he’s making his own film as a result, it’s clear that there has to be some truth behind his ‘bad guy’ nametag based on his actions and the fact that she wouldn’t have continued to get up on stage. Kapadia puts Winehouse in the best light possible, even when she is engulfed by the complete darkness of fame. One touching moment is when Winehouse is announced the Grammy winner for “Best Song” and soberly accepts her award from overseas in London with all of her biggest fans – family and friends – in one room. Winehouse is utterly speechless, excited and terrified, and her facial expression is both priceless and heartwarming. Another poignant time in the documentary was a few days before her death when her mind was apparently clear. Her bodyguard explained that she was showing him old videos of her performing and she commented (as if it was a new revelation) on how good she could really sing and alluded to her whirlwind notoriety. She followed by saying, “If I could give it all back just to walk down the street with no hassle again, I would.” That closing statement proved Amy’s humility and down to earth personality. Winehouse never wanted the fame. She just wanted to sing. Bottom-Line? 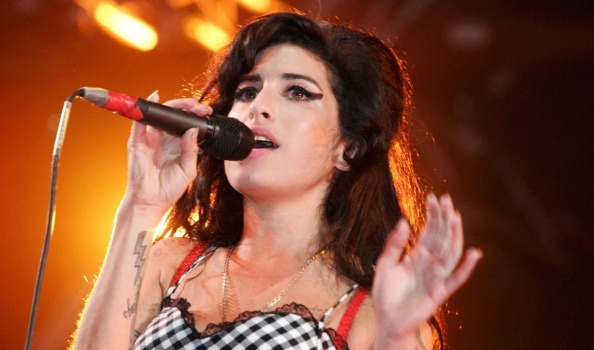 Amy is a brutally honest peek into the short, tragic life of the talented singer-songwriter, Amy Winehouse. Her beehive hairstyle simultaneously grew with her fame and forced an incredibly dangerous rollercoaster ride involving drugs, substance abuse, and bulimia, which she wasn’t equipped to handle. If you don’t appreciate the intimate shows like Behind the Music or Intervention, this biographical documentary may be too disturbing for you.